1: Dekorative Kunst, 5, March 1902, p. 205–7; The Hunterian, University of Glasgow: GLAHA 41787; GLAHA 41788; GLAHA 41789; 1901 census and birth record, www.scotlandspeople.gov.uk [accessed 17 June 2013]. 2: Dekorative Kunst, 5, March 1902, p. 205–7; Roger Billcliffe, Charles Rennie Mackintosh: The Complete Furniture, Furniture Drawings and Interior Designs, Moffat, Dumfriesshire: Cameron & Hollis, 4th edn, 2009, pp. 129–37; Alan Crawford, Charles Rennie Mackintosh, London: Thames & Hudson, 1995, pp. 90–1. Part of the original stencilled wallpaper was uncovered and salvaged in 1992 and is now held at The Hunterian, University of Glasgow, GLAHA 41281, see Charles Rennie Mackintosh Society Newsletter, 61, Spring 1993, p. 3. 3: 1901 census, www.scotlandspeople.gov.uk [accessed 17 June 2013]; Glasgow Post Office Directory, 1901–2, p. 563. 4: Although dated much later than this work, there is no other Rowat-family project with which the payment can be linked: The Hunterian, University of Glasgow: GLAHA 41118; The Hunterian, University of Glasgow: John Honeyman & Keppie, Honeyman, Keppie & Mackintosh, Keppie Henderson cash book, GLAHA 53079, p. 92. Photocopy of a manuscript copy by John Keppie of the 'Contract of Partnership between John Keppie, Architect, in Glasgow, of the first part, and Charles Rennie Mackintosh, Architect there of the second part', 10 October 1901. Supplied by Roger Billcliffe, 30 April 2012. Original untraced. 5: Information on the Rowat family supplied by Mark Stephens, a descendant, by email, 10 October 2012. 6: A copy of the report (MBS29) is held by the Charles Rennie Mackintosh Society, Mackintosh Queen's Cross, 870 Garscube Road, Glasgow G20 7EL. 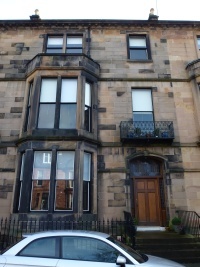 The Mackintosh Buildings Survey was funded by The Monument Trust. 8: Mir iskusstva, 1903, no. 3, p. 117; Deutsche Kunst und Dekoration, 10, 1902, p. 586.